The Bluffs Regional Park features a 2.7 mile loop hike and 2 spurs that lead to panoramic overlooks. 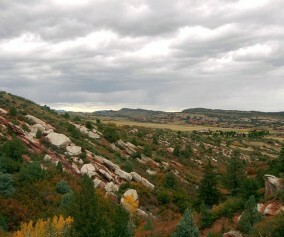 The Bluffs loop offers fantastic views of Denver and of the front range. We prefer hitting the trail as the sun is setting. As it gets dark, and the city lights begin to appear, warm winds sometimes will kick up along the Bluffs. 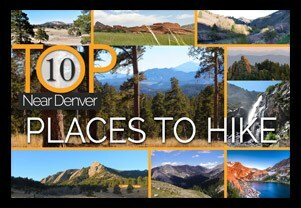 Because it’s so close to home, we have hiked the Bluffs more than any other trail near Denver. 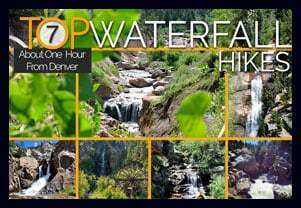 It’s the best hike in Lone Tree, it’s near Highlands Ranch, and can be made into either a great hike or trail run. We have often taken our jogging stroller, put the kids in, and hiked the loop. This makes for a great after-work workout. Because the Bluffs Regional Park is just a few minutes off of Interstate 25, it’s a great place to meet friends who may be driving up from Castle Rock or Monument. 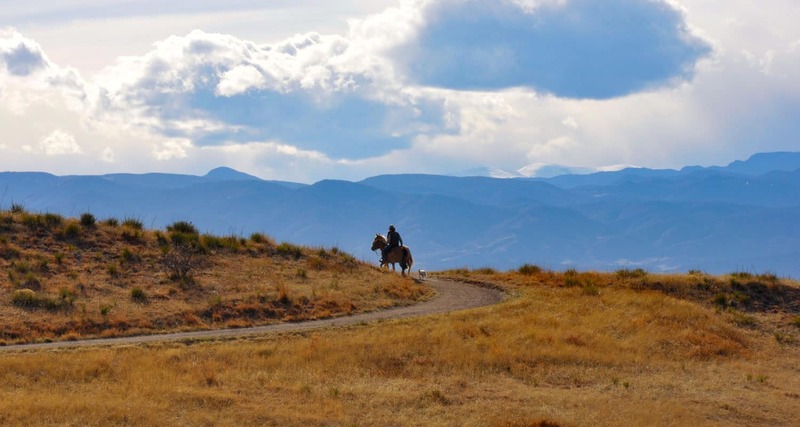 Be aware of horses on the trail and give them the right of way. There is a gentleman who likes to ride his horse in the late afternoon/early evening who can be quite reckless. We’ve seen him nearly collide with parties of hikers on two occasions. Just be aware of him. 1. The Loop Hike: We prefer to hike the loop counter-clockwise (going right onto the trail from the trailhead) because the steepest part of the trail is downhill at the end. 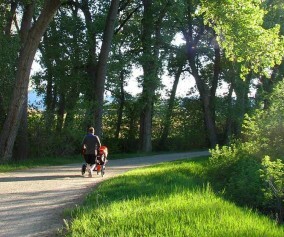 The trail does have a steady incline on the back side that can be challenge if you are pushing a stroller. 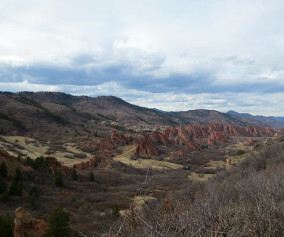 This loop hike is 2.7 miles + spurs out to two overlooks. 2. Hike Directly to the Overlook: The most direct route to the Tepe Overlook at the Bluffs is by following the trail clockwise (to the left) from the trailhead for half a mile, then to follow the spur trail for .2 mile to the overlook. This makes for a 1.4 mile, out-and-back hike. TIP: The parking lot usually fills up on weekend mornings before 9-9:30AM. TIP: As there is no water available at the trailhead, you would want to bring some with you. This is the greatest blog in Colorado! EVER! It’s ver helpful with the map and the weather right on the page. 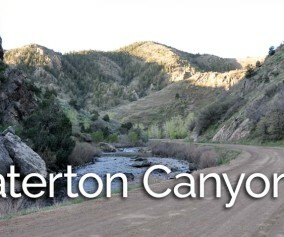 I’m definitely going to utilize this site for hikes and other family activities. Thanks Aaron! Thank you Aaron. After finding your website and reading the review, I went for this hike today with a few of my friends with their children. Strollers and kids. What a wonderful hike. Thank you for your detailed information. This is the best blog! I’d like to mention that there is very little protection from the elements once you are out there (wind, sun etc) so it is a good idea to check the weather and dress approperately. The trail is wide so it is very dog friendly. 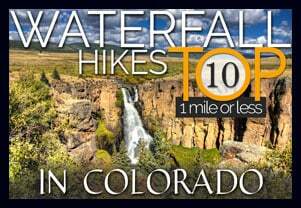 Thanks for the info about this hike. It was close to home and nice. I don’t think I would have found it if it wasn’t for you. I really appreciate your website. I’ve used it a few times and find it a great tool to enhance my hiking enjoyment. It’s obvious you’ve put a lot of work into it. Thank you. Nice open path, not too crowded at lunchtime Thursday. Good views of front range. No water and high exposure to sun wind. Trail is getting quite crowded and the bikers who think they are on a single track are often wreckless with no regards to people or dogs. Its mostly since Charles Schwab has opened close to the Park. Nice sunsets and morning hikes.